Buffered’s desktop app features a lovely, smooth interface. The simple layout features a list of servers and their ping times, although the ping times, which indicate latency, never worked when we tested it. Servers can be pinned to the top by starring them. 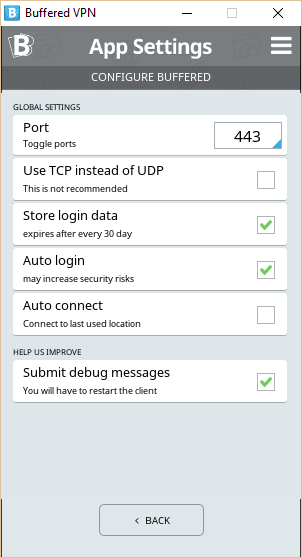 In the options menu, be sure to toggle on the „store login information“ setting so you don’t have to re-enter your credentials every time you open the app. You can also set it to automatically log in and connect. Aside from the ping data always turning up as „N/A“, the Buffered app is a simple, intuitive, and responsive client that novice users should have no problem figuring out. Buffered states, „we never log“ on its website, but what it really means is that it doesn’t keep usage logs. It does log some session metadata, including the user’s IP address, time connected, and connection duration. These logs don’t contain any of the content or activity of the user’s VPN traffic, but a true zero logs policy would still be preferable. 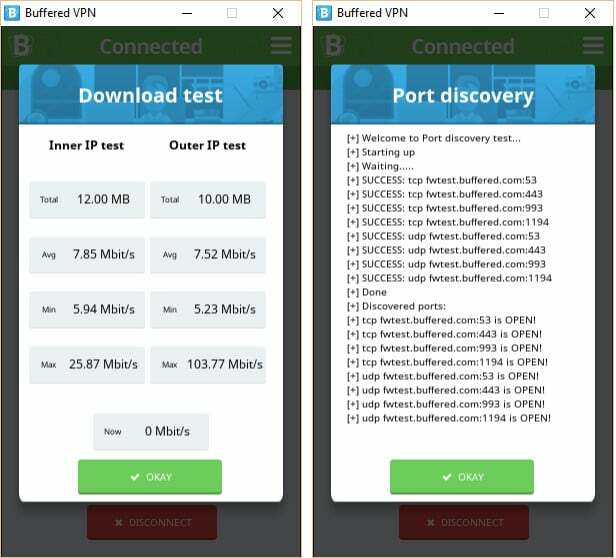 Buffered is a solid VPN service with a friendly app making it a good choice for novice users. Speeds are acceptable, security is sufficient, and it allows a lot of simultaneous connections, but nothing really screams „wow“. On the downside, some logs are kept, customer service is slow, and there’s no mobile apps. What you end up with doesn’t really warrant the high price point unless you get some friends or coworkers to pitch in.